The devil goes by many names, but for opera (and Goethe) lovers, Mephistopheles is the preferred one. With a talent the size of Samuel Ramey in the role, the devil makes some fine company in the Houston Grand Opera’s dazzling production of Faust. Francesco Zambello’s true-to-grand style feels well balanced with Goethe’s tragic moral fable and Gounod’s melodic score. Goethe’s tale of Dr. Faustus selling his soul to the devil in exchange for youth occupies a familiar place in our collective consciousness. Sounds devastating right? And it is, in the gut-wrenching scenes involving bloody choices. Still, it’s one thing to sell your soul to the devil and quite another to have the devil himself hanging around to direct the action. The evening got off to a rocky start with star tenor William Burden falling ill after Act I, Gregory Kunde filled in at the last minute, in a brave move of last-minute excitement. The character of Mephistopheles lies at the heart of Faust and in Ramey’s capable hands it’s hard to notice much else. Ramey may play Satan but his vocal tone is that of smoldering fallen angel. He plays up the humor and hidden irony in the piece as if the rest of the gang are merely pawns in his game. And they are. Ramey’s commanding presence makes for one exhilarating evening with one dashing devil. Georgian soprano Tamar Iveri grounded Marguerite with her full-bodied sound and believable acting. Iveri’s velvety voice, especially captivating in the mad scene, possesses a rare quality that invites us into her interior world. We feel her pain. 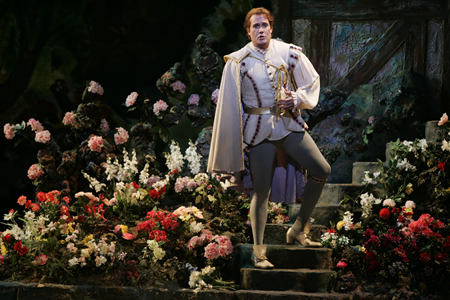 American baritone Earle Patriarco delivered a powerful performance as Marguerite’s heroic soldier brother. French-American soprano Marie Lenormand’s vibrant performance of Siebel added a breath of fresh vocal air. Liam Bonner, last seen as the 10 foot witch in Hansel and Gretel, convinced as Wagner. The HGO orchestra came through with a strong performance and the HGO chorus was especially eerie during the acappella sections. Elizabeth Bachman’s direction kept the action moving but at times the large crowd scenes felt stilted. The military parade scene felt cramped and a tad flat although jugglers and acrobats livened up the Act II. Sets and costumes by Texas painter Earl Staley placed Faust in an enchanting pop-up storybook which pushed the feeling of moral fable a good bit further. Humanoid trees and bloody scrims tossed us into a surreal world where right and wrong are more of magic than truth. The final ascension to heaven took place in an ocean of billowy vapors as Marguerite climbs the stairway to heaven. She turns to face the audience, reaches her arms out as if to accept and embrace redemption. It’s one glorious picture perfect holy card ending. Marguerite goes up while Mephistophes and Faust go down. Isn’t that how it should be.